Epithet applied to some of David's heroes. Owing to the discrepancy which exists generally between the books of Samuel and the Chronicles, it is uncertain whether the appellation refers to two or to three men. In II Sam. xxiii. 11, there is mentioned Shammah, son of Agee, a "Hararite" ( ), and in verse 33 of the same chapter, "Shammah the Hararite" ( ); but in the corresponding list of I Chron. xi. 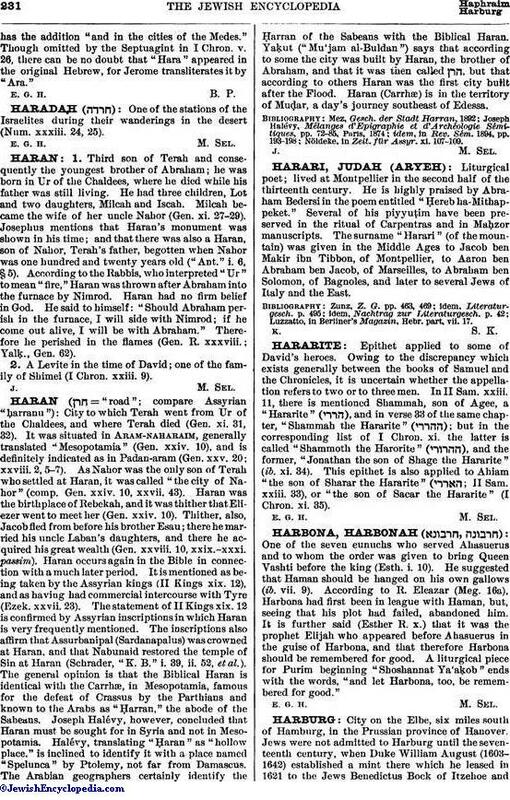 the latter is called "Shammoth the Harorite" ( ), and the former, "Jonathan the son of Shage the Hararite" (ib. xi. 34). This epithet is also applied to Ahiam "the son of Sharar the Hararite" ( ; II Sam. xxiii. 33), or "the son of Sacar the Hararite" (I Chron. xi. 35).